GWAII HAANAS, B.C. 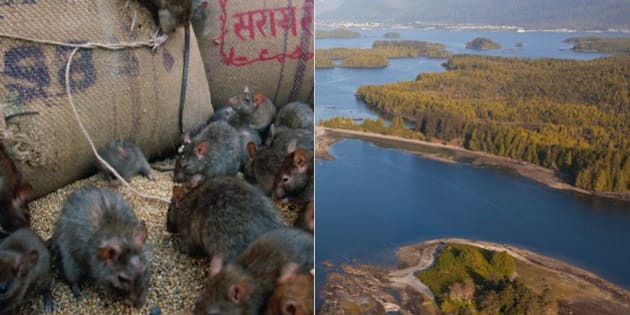 - Parks Canada has completed a second air drop of rat poison on two islands in Gwaii Haanas national park, in an effort to restore seabird colonies destroyed by an invasion of thousands upon thousands of rats. The air applications of poison were the second phase of Project Night Birds Returning, a five-year, $2.5-million plan to eradicate the rodents introduced to the Haida Gwaii archipelago by visiting ships more than a century ago. The rats eat seabird eggs, chicks and even adult birds, and important colonies of some endangered species such as ancient murrelet and Cassin's auklet have been decimated. The air drops carried out last month took place on Murchison and Faraday islands in the park, a UNESCO world heritage site. The eradication program began in 2009, with the aim of restoring the natural habitat on islands in the park where the rat population was out of control. Two years ago, Parks Canada staff distributed poison pellets on two smaller islands by foot, but this time the terrain and large area required the aerial distribution, a technique being used for the first time in Canada after its success in New Zealand, the United States and Mexico.